The waters are warming up around Japan and many of the fish coming to market now are lean like katsuo. 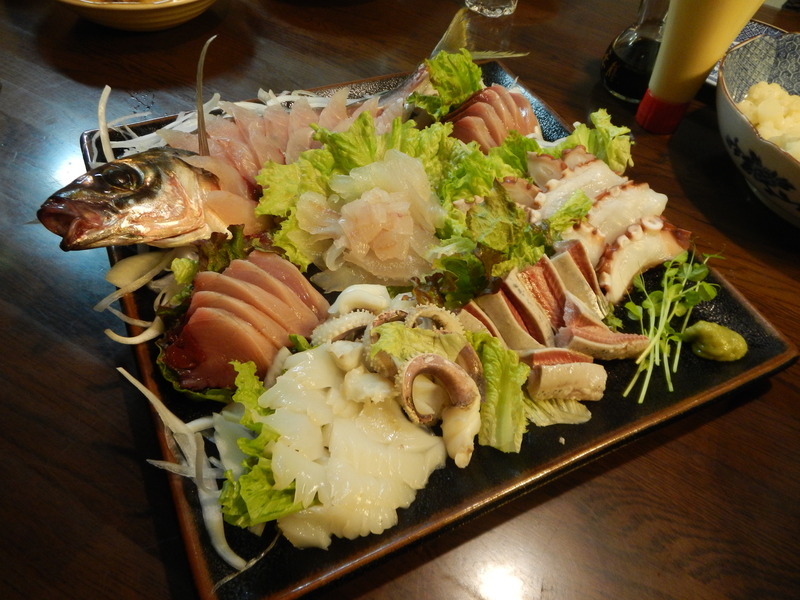 Here is a sashimi platter at our home, Izakaya Sakamoto. The big fish in the back is Tokyo Bay aji, iwashi, lean katsuo, kisu, and shiriyake-ika. 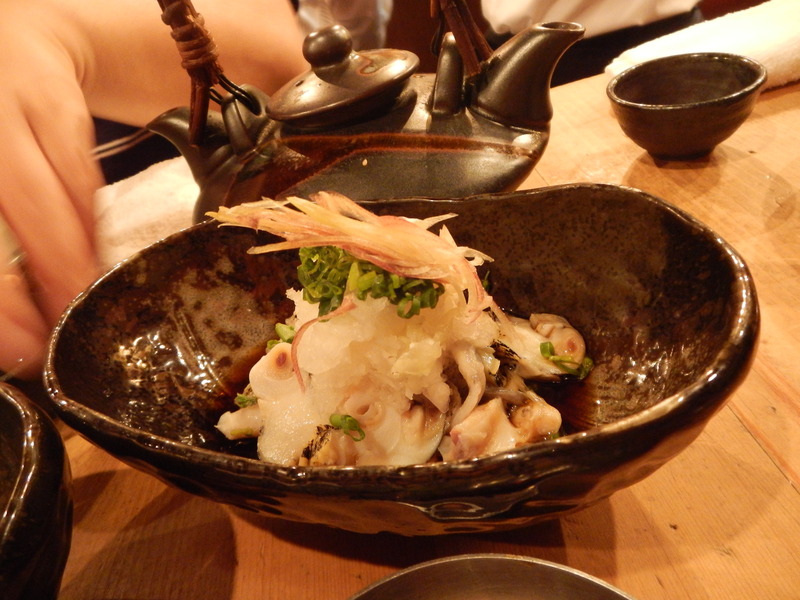 This tsubugai sashimi was served at a izakaya specializing in shōchū, Bettako. 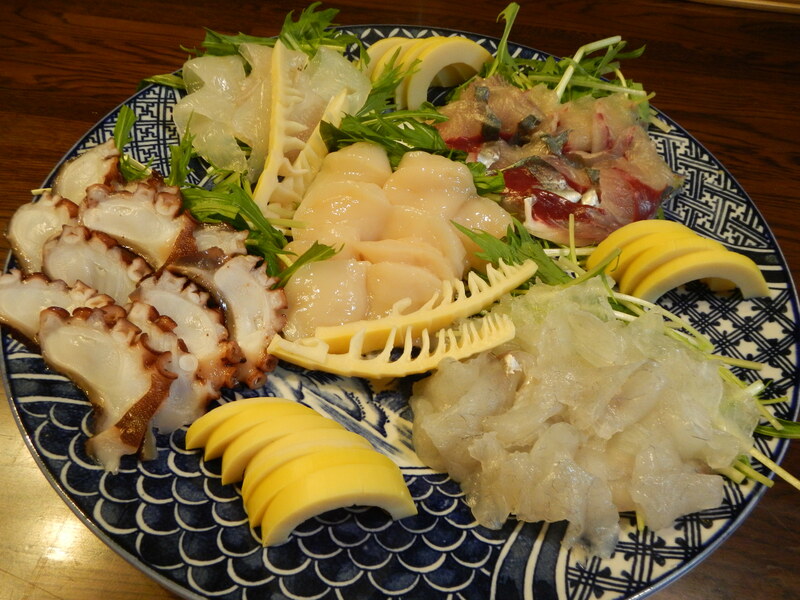 One of the joys of eating sashimi in Japan is the wide variety of shellfish. Tsubugai has a rich texture. Here it is served with some grated daikon, julienned myōga, and green onions. At a recent class at Elizabeth Andoh’s A Taste of Culture, we made a full meal from her latest collection of recipes, Kibō Recipes and Stories from Japan’s Tohoku. 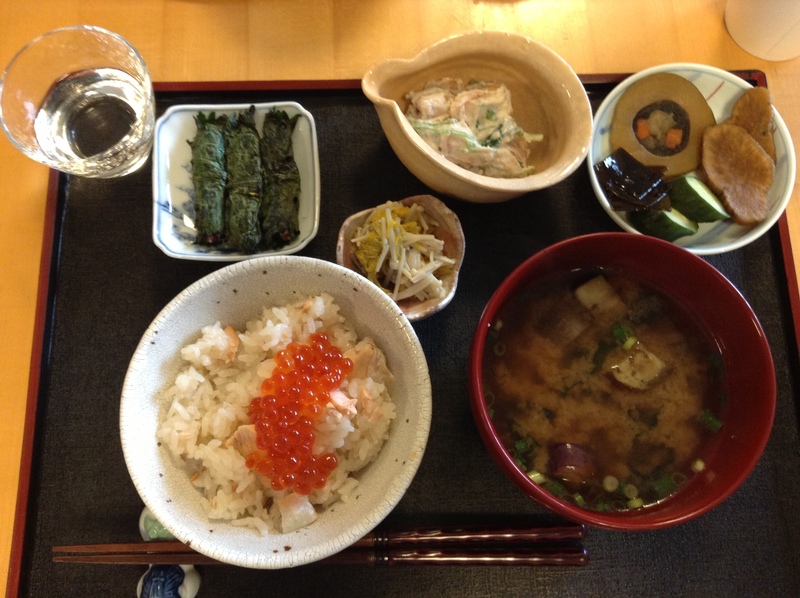 The rice dish is made with tokijake (chum salmon) and ikura. Young surumeika are just now coming into the market. They are very soft and tender. You can eat it as sashimi without peeling the skin. Here we had it barbecued. 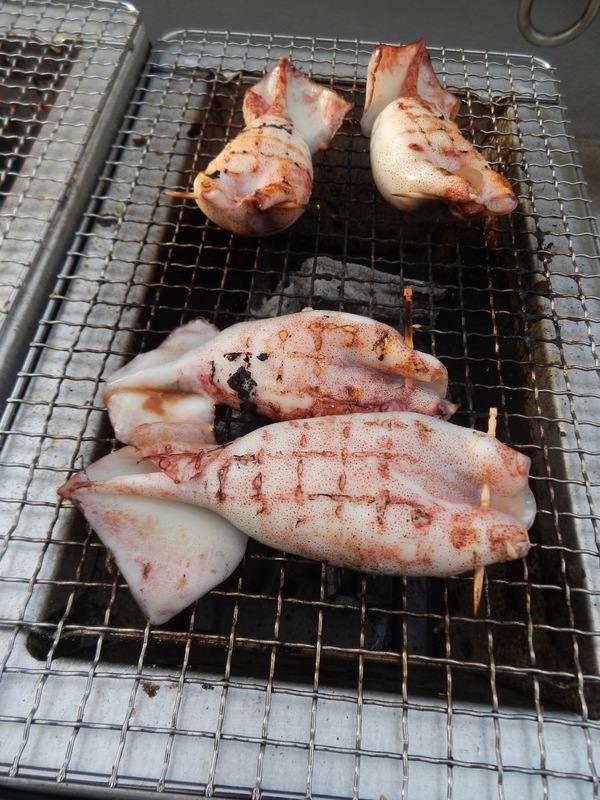 It is stuffed with its innards and legs and simply grilled. This is a sashimi platter we made on June 1st. Shinji’s father went fishing that morning in Tokyo Bay and all of the seafood, except for the Hokkaido scallops in the middle, were caught in the waters near Tokyo. This sashimi is even fresher than what customers are eating at Tsukiji Market sushi shops. Here we have aji, kochi, madako, and kisu. Also, from Tokyo Bay, is this beautiful saba. 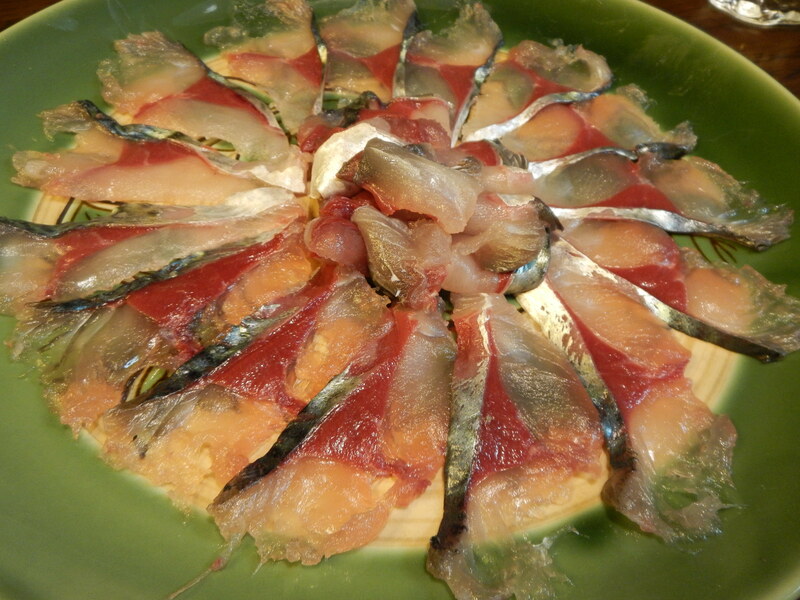 Pacific mackerel is often cured in vinegar and served as shime-saba. It’s not often seen like this, but was amazing. Not as fishy as we associate with mackerel. We served it with julienned pickled ginger, myōga, and shiso and dressed it with a citrusy ponzu. Another fish in season right now is anago. There is a restaurant in Nihonbashi that specializes in anago. A visit to Tamai, which is just behind Nihonbashi Takashimaya, is a treat, especially this time of year. What gorgeous plating and photographs, Yukari. Utterly exquisite!